* 1 The ingredients are selected for freshness and quality. They are measured in precise quantities according to the particular recipe. Liquid and dry ingredients are combined separately. * 2 The liquids are poured into a vat, mixed together, and heated. Next, the dry ingredients are added to the liquids in a particular order. Meanwhile the batch is stiffed and the temperature gradually increased. Most ingredients must be incorporated before the mix is heated to 120°F (49°C) so that the mix does not become lumpy. The mixture must be heated to dissolve and blend the ingredients. * 3 Pasteurizing the batch is necessary to destroy pathogenic bacteria and to help preserve the finished product. It is also required by law in most regions. Pasteurization is a simple process that involves quickly bringing the mix to a high temperature for a specified time and then quickly reducing the temperature to less than 40°F (4°C). The trend in the industry has been toward increasing the pasteurization temperature to about 175°F (79°C) for about 25-40 seconds. For greater results, batches can be pasteurized at temperatures as high as 210°F (99°C) to 220°F (104°C). These high temperatures also improve the flavor and help blend the ingredients more effectively. * 4 Homogenizing the batch makes it smoother, primarily by decreasing the size of fat globules to less than two micrometers. 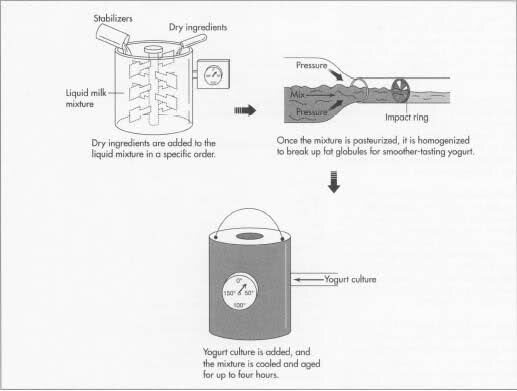 * 5 While the temperature of the mix is 90°F (32°C), it is inoculated with 1% yogurt culture. The mix remains at this temperature until it sets and is ready for cooling. * 6 After homogenization, the mixture must be cooled. If it is cooled slowly from about 90°F (32°C) to about 40°F (4°C), the mix will become more viscous. Once the temperature falls between 32°F (0°C) and 40°F (4°C), the batch is stored in aging tanks inside coolers. The mix is aged for up to four hours. * 7 The final ingredients are mixed together in a flavor vat. These include sweeteners, flavorings, and coloring. This mixture is then pumped into the freezer with the rest of the mixture which is about 20°F (-6°C) to 28°F (-2°C). * 8 While the mix is hardening, it is agitated to incorporate air and create over-run, or excess volume. The addition of air also smoothes the consistency and creates a more palatable product. In about three minutes the mix begins to freeze and within a few more minutes, the desired overrun, about 50%, is achieved. About one- to two-thirds of the water freezes during this stage. * 9 After the desired overrun is reached, the mixture is packaged and placed in freezers where the freezing process continues. The temperature falls quickly, within one or two minutes, to at least 0°F (-17°C) but ideally -15°F (-26°C). For best results, the freezing process should occur rapidly so that the mixture does not form large, coarse ice crystals but small, smooth ones. The frozen yogurt may be stored in continuous or batch freezers. In the former there is a constant flow of product into the freezer, while in the batch method, batches are prepared individually. Depending on the type of freezer and the size and shape of the package, the final hardening takes between 30 minutes to 12 hours. * 10 The containers of frozen yogurt are piled closely together inside the delivery trucks to minimize the temperature change during shipping. The vehicles are generally mechanically refrigerated at the same temperatures as in the storage facilities in the factory, about -15°F (-26°C), and not above the temperature at the retail outlet. Dry ice may be used as a refrigerant, though it risks heat-shock to the yogurt, which occurs if the temperature falls too low; the freezing point for dry ice is -109°F (-78°C). The frozen yogurt is shipped to retail outlets and food service establishments or to other manufacturers for further processing into novelties. The future bodes well for frozen yogurt as it expands into new markets with new variations. People’s interest in low-fat foods seems unabated and will, no doubt, continue to encourage the food industry to provide low-fat, tasty food. 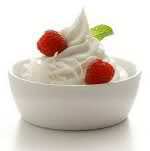 Technology will also continue to improve efficiency in manufacturing frozen yogurt as well the quality of the product. Dexheimer, Ellen. “On The Fat Track…Dairy Processors Race to Develop Better Low Fat Dairy Products.” Dairy Foods Magazine, May 1992, p. 38. Mason-Draffen, Carrie. “The Very Fat Facts.” Newsday, November 22, 1994, p. 13. Rogers, Paul. “Dairy Experts Forecast the Issues Most Likely to Influence the Industry’s Course This Year.” Dairy Foods Magazine, January 1989, p. 13. Source: “Frozen Yogurt”. How Products are Made. Do you like this food business recipe? then please consider subscribing to our PINOY BISNES RSS feed. You can also subscribe by email and have new articles sent directly to your inbox. (Once you entered your e-mail address, you need to login to your e-mail account and click the link to confirm your subscription). Extremely good content to get particular statistics’ and i love to examine this sorts of blog put up for having writing records. This is nicely well worth reading. For actual the facts ones are fun to observe as it makes it more like suspense.